A new book is less reinvention than it is revisionism. "The green building revolution has stalled," declares Jerry Yudelson in Reinventing Green Building, to be released June 1 by New Society Publishers. His premise is that certification programs such as the US Green Building Council's Leadership in Energy and Environmental Design (LEED) rating system are too costly and cumbersome: "By 2015, LEED had certified less than 1 percent of commercial buildings and homes in the US during its first 15 years. Annual project registrations and certifications for LEED in the US are now fewer in number in 2015 than in 2010. It's time for a green building program that works for 'the other 99 percent'...." Yudelson calls for green building advocates to "abandon the approach they have taken for the past 25 years." Instead, he argues, "The entire green building assessment process could easily be turned over to algorithms, eliminating a need for third-party auditors or assessors, as well as expensive consultants, essentially allowing projects to 'self-certify' and cutting costs by 10 or even 100 times." On the other hand, Yudelson's argument is riddled with holes--some small, some huge. 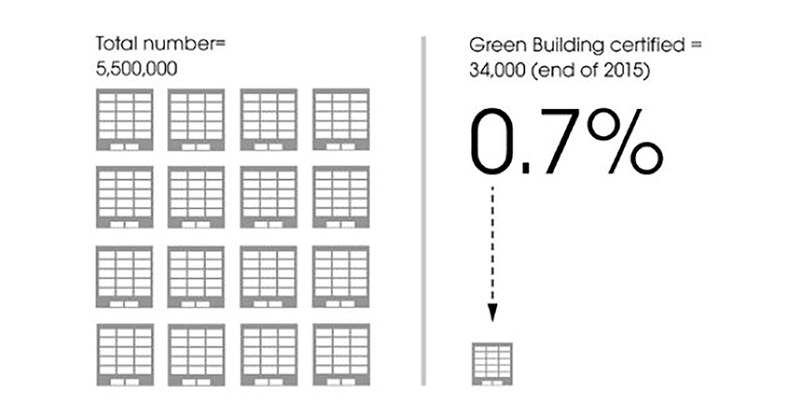 First, the state of green building may not be as dire as the author suggests. The 2016 World Green Building Trends report from Dodge Data & Analytics finds that global green construction continues to double every three years. Over the next few years, 46% of new commercial buildings, 37% of renovations, and 27% of residential construction are projected to go green. If this is true, how can Yudelson claim that green building has "stalled"? The explanation is the central problem with this book--it conflates green building and green building certification. At many points, Yudelson generalizes about the larger topic: "Green building in the US has definitely hit the wall." At other points, however, he focuses more narrowly on rating systems: "This book's thesis is that without major changes certification in the US will show no growth." The mixed message is particularly misleading when the author discusses history: "The green building movement started in the early 1990s," Yudelson claims, "with the BREEAM assessment method created by the UK government's Building Research Establishment (BRE)." In fact, the principles of sustainable design are ancient, and many of the concepts understood today as "green building" were introduced as early as the 1940s by Buckminster Fuller, who coined the phrase "doing more with less." By the 70s, many architects were exploring greater energy efficiency, and by 1987 the UN-commissioned Brundtland Report, which popularized the term "sustainability," could note, "Buildings offer enormous scope for energy savings, and perhaps the most widely understood ways of increasing energy efficiency are in the home and workplace." If energy-efficient buildings were "widely understood" in 1987, the movement didn't begin a few years later. Total US Building Stock vs. LEED Certifications, End of 2015. From Reinventing Green Building. Revisionist history is a key sticking point in the author's argument. He writes that "green building originally focused on the 'triple bottom line,'" a holistic measure encompassing society, economy, and ecology all at once. Yet, last November, in an email to USGBC chapter representatives, Yudelson described his forthcoming book this way: "Green building needs to go back to its roots in dealing directly and primarily with energy/carbon emissions, water and waste...." Did green building begin with a broad or narrow mission? In the book, Yudelson recounts that he didn't hear the term "green building" until 1997, and while he seems confused about the past, he is utterly clear about the future: "Future green building rating systems should focus ONLY on five Key Performance Indicators"--energy use, carbon emissions, water use, waste reduction, and "ecological purchasing," environmentally responsible products used in the building. This short list ignores the impact of buildings on neighboring communities, local ecosystems and habitats, land and soil conservation, and many other topics, but the most obvious omission is human health. Despite Yudelson's claims about the narrow "roots" of green building, it has always concerned health. In the 80s, the World Health Organization warned that 30% of new structures cause "Sick Building Syndrome" (SBS), acute ailments caused by poor indoor air quality, and other sources report much higher numbers. In 1987, the US EPA ranked indoor air pollution as one of the top five environmental risks to public health. When the American Institute of Architects Committee on the Environment launched in 1990, it announced, "From the excavation of raw building materials to air-borne toxins circulating within our offices, buildings have a direct impact on the world around us." The US Government's Office of the Environmental Executive, founded in 1993, promoted "increasing the efficiency with which buildings and their sites use energy, water, and materials" and "reducing building impacts on human health and the environment." Even BREEAM, which Yudelson credits with the origin of the "green building movement," includes minimum standards for health and wellbeing. Focusing on resource efficiency alone not only rejects decades of consensus about what a "green building" should be--it actually can cause serious problems. Many buildings save energy by sealing the inside from the outside and limiting how frequently the air is replenished, which can lead to stale air, lingering chemicals, mold build-up, and other problems. "Are energy efficient homes making us ill?" asked the Daily Mail in 2014. For Yudelson, does "reinventing" green buildings mean ignoring the welfare of people who occupy them? "We don't need to abandon concerns about ... healthy buildings," Yudelson assures his readers, "but they belong in a separate system." If all future rating systems should include only his five "Key Performance Indicators," what "separate system" does he mean, and why does it need to be separate? He doesn't explain the contradiction, but his personal history might point to an answer. Five Technologies Driving the Market for Building Automation. From Reinventing Green Building. 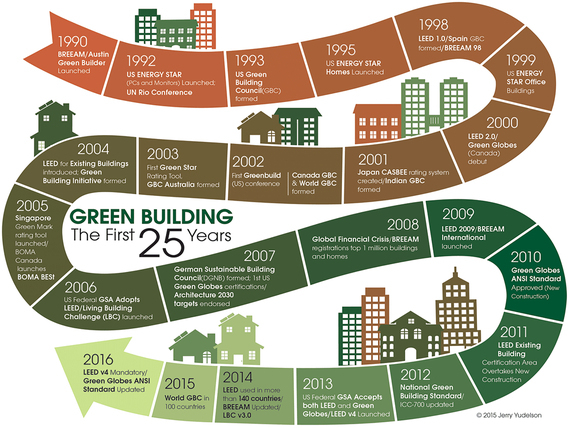 In 2014 and 2015, Yudelson ran the Green Building Initiative (GBI), which manages the rating system Green Globes, a competitor with LEED. As is well documented by many sources, GBI has been heavily funded by timber and plastics industries with a vested interest in undermining efforts to remove toxic substances from building materials, and GBI representatives have successfully lobbied to make LEED ineligible for public buildings in some states. In his book, Yudelson does mention concerns about Green Globes as "too accommodating to industry," but he ascribes these concerns only to "LEED partisans." This blind spot undermines the author's credibility--as did his positions while at GBI. As I wrote in 2014, Yudelson's public statements about the health impact of materials noticeably changed after joining GBI: before, he acknowledged the issue and recommended action; after, he claimed, "I haven't seen persuasive data." Now, by "reinventing" green building to focus only on resource efficiency, Yudelson ignores his own warning from 2013: "[W]e may be creating long-term unhealthy environments even while we're doing all of these green upgrades." If Yudelson's intent is to spur significantly greater adoption of green building techniques, his book seems misguided. Even if automating building systems can make energy efficiency more readily achievable, who's to say the market will care? "The core argument for green building," he maintains, is that "as a society we urgently need to address climate change issues." Yet, recent polls show that 30% of the American public and over 60% of Congress deny that climate change is real. Will "The Internet of Things" suddenly change the views of a hundred million Americans and the elected representatives of twice that many? Can "Big Data analytics" stop Big Oil lobbyists from holding back progress? Furthermore, if Yudelson aims to create "a green building program that works for 'the other 99 percent,'" why does he dedicate so much of his book (10 of 16 chapters) to existing programs that supposedly reach only 1% of the market? He insists that LEED's biggest problem is that it doesn't appeal to "most building owners," but he also notes that its original goal was to certify only 25% of buildings, so it was never meant to appeal to most. Why doesn't he just focus on the large remaining majority and leave LEED alone, since it obviously appeals to some building owners? Of course, he wouldn't have much of a book left over, given how little of it is dedicated to actual solutions. Green building may need a new revolution, but this book won't bring it. Follow Lance Hosey on Twitter: @lancehosey.